Finding a good bridleway is like finding a good walking route - you can revisit time and again, whatever the season, enjoying the same familiarity but always discovering something new. We might be coming towards the end of summer but there is still plenty of time to find an exciting bridleway for you and your horse to enjoy. Whether you want a laid-back, relaxing ride, stunning scenery or more challenging terrain, we have compiled a list of popular rides to suit everybody. The UK has so much to offer in terms of tranquil, open countryside and there could be a great bridleway just around the corner from you. If you have ridden in any of the areas listed below, please let us know! We are also keen to discover new bridleways you might have visited. 1) Hands down, the New Forest is one of the best areas for exploration on horseback - the 3,000 wild New Forest ponies will tell you so themselves! The Forest is also a popular dog walking route offering wonderful variety from hills and flat walks, to woodland and streams. Whether you are an experienced rider or just beginning, the New Forest provides the perfect backdrop for a leisurely hack come rain or shine. Not only is the area rural, picturesque and perfectly designed for riders with defined tracks and bridleways, it is teeming with nature, country pubs (for that much-needed re-fuel) and accommodation with livery facilities so you can enjoy a longer getaway. If you do fancy taking your dog, the New Forest offers open spaces for off-lead adventure, although it goes without saying that dogs should be under control and respectful of the wild ponies' home. 2) Perhaps not one for the faint-hearted, the Pennine Bridleway extends 205 miles through the Pennine hills from Derbyshire to Cumbria and is the perfect trail for equestrians, dog walkers and cyclists wanting to have a taste of glorious rural Britain. Made up of two loops (one longer; one shorter), the historic bridleway combines both easy and more challenging terrain that can be explored at your leisure - just pick it up wherever you fancy. If you do decide to explore the Pennine Bridleway, be prepared for hills, minor roads, changeable weather and wildlife/livestock, as well as some of the most exhilarating upland riding of your life! But don't forget to pack your mobile phone and essential supplies as the trail does become quite remote as it progresses northwards through the Yorkshire Dales. 3) When it comes to rugged, untouched landscape perfect for riding, few places compare to Dartmoor. The wild setting with its varied terrain and peaceful woodland trails isn't easily forgotten, and it's a bridleway you'll probably find yourself revisiting. Take it slowly or canter across the open grasslands, pausing to admire the splendid scenery coming at you from every angle. When you start to tire, take a pit-stop at one of the historic towns and villages on-route and enjoy a leisurely lunch. Again, many pubs, cafes and places of accommodation offer livery facilities so you can tether or turn out your horse while you take a short break. Don't forget to plan your route and go prepared as it is easy to lose your way on the moors and fall victim to its highly unpredictable weather! 4) Starting in Suffolk at Knettishall Heath Country Park and winding up on the north Norfolk coast, Peddars Way and Norfolk Coast Path is a great bridleway spanning 93 miles along the route of a Roman road in an Area of Outstanding Natural Beauty. Take it at your own pace to fully appreciate the vibrant scenery, or charge along the generally flat terrain with the wind in your hair! If you are looking for something a bit gentler, then the Norfolk Coast Path is the bridleway for you. Why not take a long weekend to explore the trail from start to finish? With so much to offer, you don't want to miss out! 5) Strath Brora in the Scottish Highlands is described by seasoned riders as some of the most thrilling bridleway in the world. Perhaps not a trail for the first-time rider, the challenging landscape of Strath Brora scales beaches and rocky bays, woodland, hills and deep valleys, taking you through breathtaking scenery and into the wild unknown. The bridleway follows a historic trail in the hills above Loch Brora, which affords stunning views of the water and lowlands. 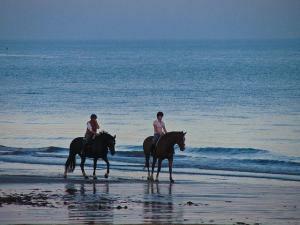 Explore at a gentle pace or let your horse stretch its legs along the sandy beaches which are ample in the region. Whatever you do and whenever you go, you and your mount are guaranteed an incredible adventure. 6) Nowhere is the British countryside showcased more than at the South Downs, an area stretching from Winchester to Eastbourne. With 1200km of designated bridleway scaling the National Park, there is plenty to see and do whether you are an experienced or novice rider. The celebrated South Downs Way covers 160km and offers opportunities for a relaxing hack over largely flat ground, or more challenging riding higher up in the chalk hills. It is worth bearing in mind that roughly 85% of the route is farmland, so be aware your trek might be interrupted along the way! It is also quite challenging and remote in places, especially higher up, and calls for lots of hill work. Make sure your horse is fully fit before attempting the whole distance and take supplies! Once you reach the top and can appreciate the stunning views, all that work will have paid off. Finally, stay safe when out hacking - plan your route, take a mobile phone and essential supplies, inform someone where you're going and wear reflective gear. Some fabulous sounding rides here, I'd love to ride the Pennine way. What about the wonderful variety on Exmoor too? I agree about Radnor, worked there with horses nearly 30 years ago so the last post evoked happy memories! Epping Forest used to be great but sadly not any more.